A few weeks ago I posted on the new series of World Cinema Directories from Intellect. The latest one to be free online before the print edition is published is Australia and New Zealand, edited by Ben Goldsmith and Geoff Lealand. This directory follows the same outline structure as the Japanese Directory. The main difference for me as a reviewer is that I have taught aspects of Japanese Cinema, but I’ve not tackled either Australian or New Zealand Cinema – only a handful of selected films for specific purposes. I hope this means I can be more objective about the usefulness of the whole project to students and cinephiles generally. There is one other obvious difference comparing this publication with the Japanese Directory – two separate industries and two editors. In practice, the major part of the guide is devoted to Australian Cinema and New Zealand gets only around 66 specific pages out of 340 overall. As far as contributors are concerned, it is significant that nearly all are academics (i.e. no film journalists). Both countries have developed academic film studies in parallel with the UK and North America so that all the contributors are based in one or the other of the two countries. Compared to the Japanese Directory, I recognised many more names, including some from the ‘Senses of Cinema’ website based in Australia. The Australian section picks out four directors and a number of genres for essays with accompanying short entries on individual films. The four directors are Peter Weir and Baz Luhrmann and two more surprising choices – Cecil Holmes, a director working in the 1950s-70s that I was unaware of, and Michael Powell, who made two features in Australia after his forced exile from British Cinema. The genres selected are: ‘Bushranger’, War Cinema, Crime, Prison, ‘Period’, Comedy, Coming of Age, Horror, Road Movies, Science Fiction and Fantasy, ‘Ozploitation’ and Short Films. The essays begin with ‘Disability in the Australian Cinema’. The New Zealand section features three directors – Shirley Horrocks, Shuichi Kothari and Vincent Ward. There is a general section on ‘Genre and Themes’ with various short essays, an Introduction addressing ‘New Zealand Film in 2009’ and a separate short section on Experimental Film. Overall the number of short film reviews is much less than in the Australian section. There is also a comprehensive Bibliography and a listing of useful websites. From my perspective of comparative ignorance, two points about the contents of the Australian section stood out for me immediately as I skimmed through the Directory. First was the wealth of material about Australian Cinema before the 1970s – about which I knew very little. Compared to this was the relatively less substantial coverage of the ‘New Australian Cinema’ of the 1970s – the period when Australian films seemed to appear quite suddenly in the global marketplace (or was it just the UK?). The introduction to the guide is very good in explaining why debates about Australian Cinema developed in the way that they did (with a concentration on how national identity was represented and a disavowal of genre) and overall I found this to be a coherent presentation of Australian Cinema with interesting debates about industry and culture. Nevertheless, the Directory is still to some extent constrained by its structure. Australian Cinema is slightly confusing for the newcomer. Some of the debates are familiar for scholars of British Cinema – a history of popular audiences preferring Hollywood to local production for instance. Yet there is also a history of public funding and a variety of local production that compares very well with countries of a similar size and wealth. This means that the Directory can’t offer a full account of Australian Cinema past and present. Editorial decisions about what to include and why become very important. For example the 1946 film The Overlanders acts as a useful study text (easily available on DVD) in relation to several debates. Made by the distinguished British documentarist Harry Watt for Ealing it represents inward investment from the UK (as distinct from the Hollywood funding of Baz Luhrmann’s Australia which borrowed some of its ideas) and raises questions about how British creatives constructed representations of Australian national identity. The film originated as part of an Anglo-Australian propaganda exercise with a ‘typical Australian’ refusing to kill cattle in Northern Australia as part of a scorched earth policy developed because of fear of a Japanese invasion. Instead the cattle are driven for hundreds of miles to Queensland. In the Directory, the film is discussed in the ‘Road Movie’ section, but it could have appeared in the War Film section or the ‘Period’ section. Alternatively, Watts’ work in Australia could have been considered alongside Michael Powell or the other Ealing Films made in Australia during the 1940s and 1950s. My point here is not that I disagree with where the film appears – simply that in a Directory in which readers might select to read one section rather than another, making the links is not so straightforward (though it could be in a fully ‘online project). I find it difficult to comment on the New Zealand section having seen so few of the films. Some of the debates are similar, but overall the relatively limited resources/local box office potential of New Zealand compared to Australia does create extra problems (not least the enormous disparity between Peter Jackson-produced international blockbusters and all other local production). I’m not sure whether New Zealand film academics/fans will be happy that the Directory gives them exposure or that they will resent being a kind of appendage to a primarily Australian Directory. I’m sure that someone could let me know! Although there is no entry on Newsfront as such in the Directory, there is an interesting essay by Bonnie Elliott which analyses the context of its production (in the ‘Period Film’ section). Overall, I found this a very interesting collection and I’m pleased to have been introduced to a range of films with which I’m unfamiliar as well as more familiar titles that I can now see in a new light. If you want a free copy download it now from Intellect Books (free offer ends soon!). This entry was posted in Australian Cinema, Book Reviews and tagged New Zealand Cinema. Bookmark the permalink. Thanks for putting this post up. I’ll get hold of the ebook asap. I’d got hold of the one on American indie, too, thanks to your post. Unfortunately, I’d missed the one on Japanese cinema. 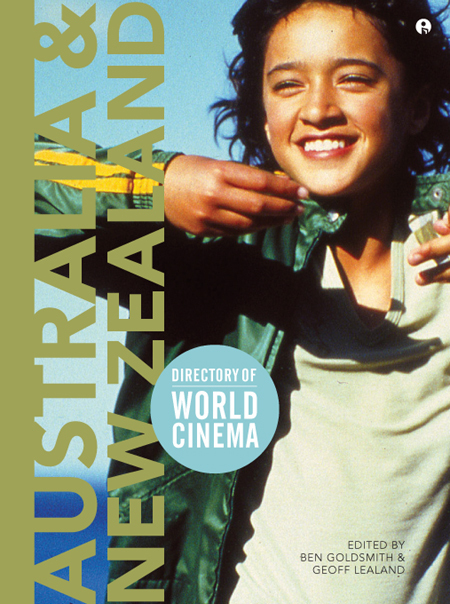 As the editor of the New Zealand section of this Directory, I am well aware that the bulk of the book is about Australian film, with the New Zealand content somewhat slimmer. There are a number of reasons for this: the contrasting population base (Australia=22; New Zealand=4m) and resultant film outputs; the different production circumstances (in NZ, the relationship between off-shore productions and a largely subsidised local film industry); the potential pool of good writers about film etc etc. In respect of this first volume, my expectation is that the NZ contribution will increase in subsequent volumes (the next in 2012)–especially in respect of covering the ‘back catalogue’. Once people see the first volume, my feeling is that I will be able to recruit more writers and more content next time. Certainly, Ben has a great job in respect of the Australian content. I appreciate too the comments you have made here. Let me know if you would like to know more about the process of putting this book together.